We fade in on a list of statistics about space as the edgy synthesizer music builds in the background. The earth rotates at a speed of about 1000 miles per hour. The temperature is about -273 degrees celsius. There’s no gravity. No oxygen. No air pressure to carry sound. No one to hear you scream or cry for help. Nothing to save you if your suit fails to sustain you. Nothing to stop your momentum if you’re flying in the wrong direction. If you get into trouble out in space, you are all alone. Life in space is impossible. This sort of tension and desperation is felt on an emotional level so intense in Alfonso Cuaron’s Gravity that I feel like I’m in space experiencing the same things that these characters are experiencing, not watching the chaos unfold from mission control. The plot follows three astronauts who are working on repairing a satellite in orbit. Dr. Ryan Stone (Sandra Bullock) is a mission specialist who is working hard at repairing the satellite on her very first space mission. Lieutenant Matt Kowalski (George Clooney) is an experienced space veteran who is retiring after this final expedition. Shariff Dasari (Paul Sharma) is a flight engineer who carries a photo of him, his wife, and child inside his suit. Early into their mission, the team gets a warning from mission control, saying that there is debris from a missile strike on a Russian satellite orbiting the earth, but that it shouldn’t collide with their trajectory. Now if that isn’t a case of foreshadowing, I don’t know what is. Eventually, the debris sets off a chain reaction of destruction, and it eradicates the shuttle that they came on. Shariff is killed, Kowalski loses communication with mission control, and Stone is left desperately hanging on to her life as she floats aimlessly away from their space module. When Stone and Kowalski eventually meet up again, they have to race against time and fate as their oxygen levels continue to deplete, and need to find a way home before they are truly lost in space forever. Man oh man, where to start. Gravity is a film for a generation, a picture that is so convincing and so believable in its approach that its nearly impossible to think that it wasn’t even filmed in space. It is visually stunning, emotionally gratifying, immensely captivating, and surprisingly involving, a picture that latches you on in its first shot and doesn’t let you go until hours after you’ve left the theater. Who is responsible for this feeling of attachment and interest? Why that is director Alfonso Cuaron, of course, who co-wrote the script with his son Jonas. Cuaron, who is most known for his mainstream films including Children Of Men and the third Harry Potter movie outdoes himself here. Not only has he made a compelling and visually breathtaking science-fiction film that visually challenges that of Avatar and Inception: he’s also made a emotionally captivating story with the human interest equivalent of Argo or Captain Phillips. Oh, I’m not saying he isn’t already a great director: lord knows he’s delivered as much visual and emotional appeal as he did with Children Of Men and Prisoner of Azkaban. But Gravity is head and shoulders above anything else he’s done in his entire career. Why? Everything in the movie is immaculate and intentional, from the physics and dangers of space to characters emotions and complexions. Look at the delicacy and the concentration on Cuaron’s shots. Look at how well he orchestrates a scene, whether a large, imposing space station is crumbling all around Earth’s orbit, or a astronaut is just awkwardly fitting herself in tight corridors around a space station. In each shot, there is interest, there is intricacy, and there is involvement. Whether its a big, intimidating destruction scene or a small conversation between characters doesn’t matter. The interest remains, and its boy does it keep your attention. Visually, the film is unparalleled, hooking you on with all of its space-station grandeur and elegant scenery of earth from outer space. Part of this no doubt goes to the visual effects team led by supervisor Tim Webber, but a large accreditation needs to be made to cinematographer Emmanuel Lubeski, who collaborated on Cuaron’s other films including Children of Men and Y Tu Mama Tambien. Lubeski, who was nominated for an Oscar a few years ago for Terrence Malick’s Tree Of Life returns with the same artistry and craftsmanship that made him an artist in his own right. The camerawork in the film evokes a feeling of both reprehension and serenity, the same eerie feeling you get when you watch the slow, steady moments building up in Stanley Kubrick’s 2001: A Space Odyssey. It works in conjunction with the film’s plot and with Cuaron’s handling of it, a marriage of collaboration so essential that its doubtful anyone could be as fluid or as controlling as Lubeski is, not even Wally Phister’s steady, reliable camerawork from Christopher Nolan’s Inception or Dark Knight trilogy. High praise, I know, but it’s well deserved. The visual effects alone have not made this movie. It’s Lubeski’s intricate framing and filming that not only captured these great shots, but intensified them, evoking the anxiety and unease of space just as much as the visual effects and sequencing does. Bullock and Clooney are affectionate and grounded in their performances, pun intended. Going in to the movie, I was really worried that the both of them were going to phone in their roles and just let the visuals take over, much like the Michael Bay/Roland Emmerich action movies you see nowadays. Boy, was I wrong. Their characters are real, charismatic and likable people in their own right, people who you’d probably like to sit with and share a conversation with over at Starbucks. Their chemistry is infectious with each other, as memorable and dynamic as the relationship Tom Hanks and Kevin Bacon shared with their crew mates during Ron Howard’s Apollo 13. You don’t only care for these characters because of their situation: you care for them because they are human beings, because they have hopes, dreams, and letdowns of their own and you want to see them make it through all of it. This is what I love most about the movie: not just that it handles itself well as a science-fiction movie, but it handles itself well as human drama, period. This is seriously one of the best films of the year. I’m not saying that because it is science-fiction. I’m saying that because it is seriously one of the best films of the year. Under a different director, a different writer, cinematographer, composer, or even under a different cast, this film could have failed. It’s hard to take a movie that takes place in an enclosed, blocked off environment separated from society with only one or two characters and make it interesting, and the filmmakers here have accomplished that in spades. 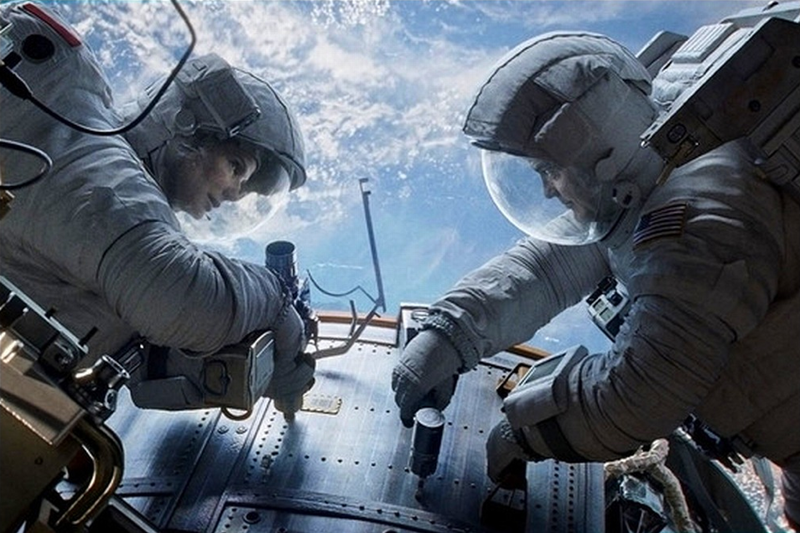 But Gravity is much more than a survival film. It’s more than a science-fiction film. It’s an epic and emotional story about an astronaut trying to survive, a woman trying to cope with living, reality, and tragedy, and the unhindered spirit that pushes her to keep living, even when all of the forces of nature tells her that she can’t. It blurs the line between science fiction and science reality and is quite possibly the best space movie I’ve ever seen.